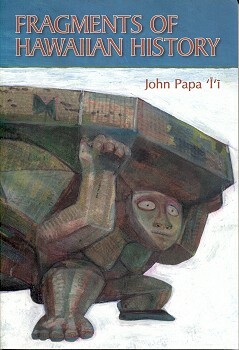 John Papa Ii : Fragments of Hawaiian History, 1870. Originally printed in a series of articles 1866-1870, written and published in the native Hawaiian language. First English translation printed 1959. Second printing 1963, Third printing 1973. Revised edition 1983 as Special publication 70. Second revised edition 1993. Sixth printing 1995. Pages 6, 7-8, 20, 50-51, 55, 63, 64-66, 67, 69, 72, 82, 95,107,109, 110, 132 to 137, and157-158. A few days after Kamehameha placed the kingdom in his uncle's charge, the opposing sides again met in combat. After a short battle, Keaweopala fell into the hands of Kalaniopuu's army, and this brought peace to the kingdom. Kalaniopuu then returned to Kau, but he left Kamehameha with his mother, Kekuiapoiwa II, and his guardians, Keaka and Luluka, at Puu in Holualoa, a place inhabited in Alapai's time and before. It was in the Holualoa lands of Kona that the chiefs dwelt in olden times, from the time of Keakamahana, the great kapu chiefess of Hawaii, and earlier. Where the large stone wall is located above Keolonahihi was Keakealaniwahine's dwelling place, for her parents, Keakamahana and Iwikauikaua, resided there. These were lands occupied by the chiefs because the surfing there was good, and the food abundant in ancient times. There Kamehameha learned to surf and to glide with a canoe over the waves, guarded by the kaikunane of Keaka, in accordance with her commands. Because he was well trained, Kamehameha excelled in these arts and in sailing canoes. When Kalaniopuu next arrived from Kau, it was to take Kamehameha away with him, perhaps because Kamehameha's mother had died. This was in accordance with Keoua's request before his death. When they left, they were accompanied by Kalaimamahu, son of Keoua and Kamakaeheikuli and half brother of Kamehameha. Upon their arrival in Kau, Kalaniopuu placed Kamehameha with his wife, the chiefess Kaneikapolei, who put Kamehameha in the hands of her kaikunane relatives, Inaina ma. He was there for some time and was familiar with the life of the court by the time he became associated with his older cousin, Kiwalao, the son of Kalaniopuu and Kalola. It was the custom of the chiefs to have sports such as racing, "maika" throwing, diving feet first, hiding the "no'a", boxing, surfing, sledding, sham fighting, and many others. These increased when the kingdom was at peace, as it was when Kalaniopuu first became king. When Kamahauluae reached Kau, he located the place where he had been told to land and took the canoe ashore there, where a house was ready for him and his companions. That day he raised his banner near the place for surfing, a pastime much enjoyed at that time. He knew that his beloved chief, Kamehameha, was very fond of surfing and that this would probably be a good way to have the chief recognize him immediately. When Kamehameha arrived at the surfing place, he recognized the banner and went to the boy at once. In greeting him ("a honi ana i ka ihu") Kamehameha said, "So you have come to land?" "When did you leave home?" "How are Kalopelekai and her companion (Keaka and Luluka) ?" "They are well and send their regards to you." "Your guardians said that I am to go home after I have learned how you are faring." "Yes, that is well. I am going surfing now and shall return. Have you a malo of mine?" "Yes, I came prepared with such personal articles of yours." When Kamehameha had finished surfing he returned to find his container of bathing water and a fresh malo ready. Kamehameha remained there day after day, and the two met daily. Because Kamehameha did not return home for many days, his attendants were puzzled and told Kaneikapolei about it. She, in turn, told Kalaniopuu, who asked about Kamehameha's habits and the place at which he was staying. Then he sent for Keawe a Heulu, and while they conversed Keawe a Heulu told him of Kamahauluae, the cousin of his wife Ululani. So Kalaniopuu understood, and he left his nephew with Keawe a Heulu. Thus did the affection and respect between them remain, down to Keohokalole, the mother of Kalakaua. Her names were Wanaoa, Pahulemu, and Kalaikane. The name Pahulemu (Shove-from-the-rear) was derived from a lack of skill in surfing, which required the aid of the skilled. The learner would lie down on the board to ride in on the surf, while the skilled one held onto the back end ("lemu") of the board when the surf rose. When the surf drew near, the instructor gave the board a shove ("pahu") and the surfer rode nicely toward the shore. This was the meaning of that name, O companions. Kaahumanu's Wrath* and Surfriding at Kapua. When, in 1809, Kanihonui, a nephew of Kamehameha, was put to death for committing adultery with Kaahumanu, Kaahumanu's wrath was aroused. ... taking the kingdom from the king by force and giving it to the young chief, Liholiho. Before she laid her plans for the war, a holiday for the purpose of surfing at Kapua in Waikiki was proclaimed, because the surf was rolling fine then. It was where one could look up directly to the heiau on Leahi, where the the remains of Kanihonui were, all prepared in the customary manner of that time. It was said that only Kaleiheana, who was a Luluka, watched over the corpse from the time of death until it was decomposed. The chiefess had heard something about her lover's remains being there, and perhaps that was why the proclamation was made. On the appointed day, chiefs, chiefesses, prominent people, and the young chief Liholiho went to Kapua. When all had assembled there, the king gathered his men together in readiness for trouble. He sent a messenger, Kinopu, after Kaahumanu's followers to find out what they were planning. It is said that three things were done at Kapua: surfing, lamenting, and more surfing; and it is said that they had intoxicants with them. Thus they whiled away the time until evening. *Circa 1808, Kaahumanu attempted to lead a coup against the reigning king, Kamehameha, offering to support the young Liholiho. Liholiho declined, with much credit, and the plot evaporated. I'i Paddles to Kuo by Canoe and Returns to Waikiki. When the boy (John Papa I'i) and his mother boarded a canoe and left the harbor of Kou, he asked for and was given a paddle to wield. Earlier he had learned a little about paddling a canoe made of 'wiliwili wood' that his parents had provided for him. It was his mother who taught him how to paddle, and he became adept at it. They landed in Ewa, where his parents performed all their duties and tasks in a few days. They returned to Honolulu in the canoe. About two or three weeks after the trip to Ewa, on the day of Muku, the last day of the lunar month, all of the chiefs went to Waikiki to surf. When evening came they went to Leahi, where the royal parent, Kamehameha, had a house separate from that of Liholiho. Ii and Papa shared the house of the young chief. In his childhood, Ii and his companions knew many games to play, some of them the same sports which he was to see at the royal court. Some of the games he knew in the land of his birth were running, 'maika' rolling, 'puhenehene', pulling or dragging a person, fencing, and quoits. There was diving at Waikahalulu or at Puehuehu, places usually crowded with both chiefs and commoners. This was especially true of the junction of the stream below Makaho, where they went bathing. They also went sea bathing or canoe and board surfing at Ulakua, just makai of Koholaloa, when the waves rolled and broke perfectly. Only those who were skilled could perform these sports. So it was with 'ko'ie'ie', a water sport; with the sailing of coconut sheaths; with skimming stones on the surface of the water; with tug-of-war; and with the game of staying under water as long as possible. Surfing at Waikiki was greatly enjoyed by many, and so were "maika" rolling, sliding, pushing, running, throwing a stick and making it stand upright, "konane", "puhenehene", "uma", wrestling, pulling with the fingers, hula dancing, and chanting. All of these amusements were commonly practiced by the children of that time but the boy saw some of them for the first time when he went to the royal court. Diving at Nihoa, Ohau, circa 1815? Another treat for Ii was to go to the waterfront at Nihoa, the area now bounded at either end by Kaahumanu and Nuuanu Streets, to see the ships built by Hawaiians under the direction of haoles. It was indeed a sight to see all the ships lined up on shore like canoes. They had cabins astern, the size of the cabins depending upon the size of the ship. The boy climbed over each one, but always with an eye out for the watchman. He spent some time at Nihoa whenever opportunity afforded and then returned to tell all he had seen. To his makai side as he faced east from Kaahumanu Street, the boy could see as far as the Hale Mahoe [as the Swan and Clifford building of the time of this writing was called]. In front of him was a house with double doors facing Ewa, with three small grass houses in front of it for the chiefesses. These were fenced in like Papa's house. Makai of them was the mua, or men's house, called Halehui, which faced Koholaloa and served Kamehameha I. ... rocks where a three-masted foreign-built vessel could be seen. This was the "Lelia Bird", or the "Lelepali", which had been bought by Kamehameha I, who named it the "Keoua". The ship was tied to the shore by ropes, and a gangplank of boards reached from shore to ship. Here gathered the ship's crew and those who came to dive. One who was skilled in diving was admired for the trim way he dove into the water without a splash. Such a diver made only a soft sound as he came swiftly down, and only the gurgling sound of the sea was heard as he entered the water. Just makai of that place was a canoe landing, and eastward from there stood the canoe building shed of Kamehameha. Gambling was common in foot racing, canoe racing, surfing, boxing, hand wrestling ("uma"), pulling with the fingers, wrestling, dragging a person, sliding, playing "puhene", "puhenehene", and "konane". Betting became a pitfall for those who did not know the scheme secretly followed by the experienced bettors. If there was to be a "maika" contest or a foot race, it was customary for the contestants to be kept at home until the day of the contest, watched over by their assistants, lest a contestant be harmed by the backers of the other side. Many bettors who had not yet laid their bets and paid them to the assistants visited the homes of the contestants to examine their physiques and the way they sat or stood. Bets were placed on the contestant who appeared to be the stronger in rolling the "maika" stone or the swifter in running. We have already seen some things accomplished under Kamehameha, but some not mentioned previously were fishing, canoe-making, paddle-making, and the like. His craftsmen were as well cared for as were his farmers, and there were many of them. His wish was to obtain prosperity for the people. The Chiefs' Attraction to Surfriding. According to Kamanawa's counsel, Kamehameha had divided the large ahupua'a tracts and the smaller " 'ili'aina " tracts of land all over Oahu among his chiefs. Kamanawa was the twin brother of Kameeiamoku and perhaps they were the origin of the name Namahoe, The Twins. Parcels of land at Waikiki, where the chiefs liked to live because of the surfing, were given to chiefs and prominent persons. Other "ahupua'a" all over the island of Oahu, which Kamehameha had won after the battle of Nuuanu, were also divided. The "makahiki" ceremonies began in the month of August, called Hilinehu in the Hawaiian calendar, before the gods came out of the "luakini". In the month of October, Ikuwa by Hawaiian count, the king declared a single kapu night, called Kuapola, in the "luakini". The kapu period extended from evening far into the night. At dawn the "makahiki" gods were taken to the beach, which was crowded with bathing chiefs and commoners. The report of Kaumualii's coming spread everywhere, and the town made all preparations to welcome the guests. That afternoon, the wharf at Pakaka and other places were crowded with people who were to make ready the canoes and boats of the king and chiefs who were to go out to the ship. There were two double canoes, three rowboats, and one single canoe. The king selected four men to man the single canoe in which he and Kekuaokalani rode. They boarded on shore before the canoe was lifted up by men standing in rows from prow to stern. With one hand each, they set the canoe afloat in the sea. The paddles of all the craft dipped together, led by the single canoe with Kamehameha sitting at the stern, a suckling pig in front of him. Those on board the ship watched the approaching canoes, for they had received a report that Kamehameha was coming on board. When the canoes reached a spot in the harbor just outside of Ulakua, the single canoe went alone into Mamala channel. Passing the surf of Awalua, it proceeded to Kukuluaeo, close to the surf. It was not noticed by those on board the ship, for they were busy watching the double canoes and boats for sight of the king. Kamehameha's canoe, which was on the seaward side and about half a mile away when the other canoes drew close to the ship, caught the crest of a wave and rode in, reaching the ship ahead of the other craft. While Kamehameha returned to shore, those on board talked much of his skill and graciousness. The trail began again on the opposite side of the pool and went to the lowland of Halawa, on to Kauwamoa, a diving place and a much-liked gathering place. It was said to be the diving place of Peapea, son of Kamehamehanui of Maui who was swift in running and leaping. The place from which he dove into, the water was 5 to 10 fathoms above the pool. It is well to speak briefly here of the many people, both Hawaiian and haole, who have perished because they did not know how to swim. Therefore, our children of today should learn the art of swimming. Lahaina, circa 1812 : Kamehameha's Return to Hawaii from Ohau. They went ashore there at Lahaina on a canoe that came out to the ship. The boy saw black 'kala' seaweed from Mokuhinia, and this recalled the familiar seaweeds of his birthplace. It was wonderful to see the breadfruit and coconut groves of Lele, thriving from one end to the other. Boys were surfing on the north side of Pelekane, with banana trunks for surf boards, and Ii watched with delight. Adults were surfing outside of Uo. Kamakahonu was a fine cove, with sand along the edge of the sea and islets of pahoehoe, making it look like a pond, with a grove of "kou" trees a little inland and a heap of pahoehoe in the center of the stretch of sand. A stone wall ran inland from the right side of Kamakahonu, and on the other side of that wall there was sand as far as a rock promontory. This sandy stretch, called Kaiakekua was a canoe landing, with some houses mauka of it. The rock promontory above Kaiakekua is the Pa o Umi. Beyond it are the sands of Niumalu, and next, the spot where Hulihee Palace now stands. On this land, Kalakee, was the first site of the king's residence, and his house was called Papa. Outside of the enclosure, by the edge of the sea, was a spring called Kiope. Its fresh water came up from the pahoehoe and mixed with the water of the sea. It was a gathering place for those who went swimming and a place where the surf rolled in and dashed on land when it was rough. It was deep enough there for boats to land when the tide was high, and when it was ebb tide the boats came up close to its rocky pahoehoe side. From there the sea was shallow as far as the spring of Honuaula, where there was a house site on a raised pavement. There the young chief lived. Just makai was a patch of sand facing north, where canoes landed, in front of the heiau of Keikipuipui. A Hale o Lono faced directly toward the upland, and toward the north there was a bed of pahoehoe which reached to the sea, where there was a surfing place for children. To the south was where the waves dashed onto the land. West of the Keikipuipui heiau was a surfing place called Huiha, north of Kapohonau. Later, a heiau was built there by the king. Honuaula has a cove that opens to the south. When the Kona wind blows, it is not a safe port because of the huge waves from the south, depending upon the force of the wind. Perhaps that was how the ship Kekauluohi was driven ashore at Kaiakekua at one time. When the Kona wind blows, it is a time for those who are proficient to go surfing. The Ahuena Heiau House, Kamakahonu. See Map on page 118. After these houses were built, another heiau house, called Ahuena, was restored ("ho'ala hou"). This house stood on the east side of the "hale nana mahina 'ai", separated from it by about a chain's distance. The foundation of Ahuena was a little more than a chain from the sand beach to the westward and from the rocky shore to the eastward. Right in front of it was a well-made pavement of stone which extended its entire length and as far out as the place where the waves broke. Behind Ahuena, the surf turned right and broke on the pahoehoe as far as Kaliliki. Akalele was alone on a single canoe about 6 fathoms long and filled with baskets of sweet potatoes, fowls, dogs, and such gifts as people brought who came to see the king on the beach in Kona. When they arrived at Kahaluu, or Keauhou perhaps, the single canoe began to race with the double ones, to see which could first reach their goal, Awili in Kaawaloa. So they raced, the king with his canoe paddlers, Akalele alone. Although the single canoe was loaded with goods, the king desired this race. A paddle on one of the double canoes made a rattling sound at the prow, and the contestants began to paddle. The canoes kept together past. Kahoopa-heehee Point and beyond Honalo. As Kanaueue Point was passed, they were still together, and they kept together at Naawaawa. At times one of the double canoes would be slightly ahead of another, and Akalele kept up with the outrigger of the last canoe. Then Akalele caught up with the outrigger of the foremost canoe. Each canoe strove to win; but first one, then the other, fell behind as far as Keawakaheka, where they turned shoreward. After they passed Keopuka and reached Kalaemano at Kaawaloa, they again turned shoreward. Near the harbor of Awili, where there is a narrow channel only large enough for a single canoe, the king called out, "0 Akalele, turn your canoe into the narrow entrance! Glide in on a wave!" Akalele did as he was told and was first to arrive at Awili. The others took the longer way around and found him there carrying the things ashore. The king helped Akalele because he was a stranger. Kualii, a paddler from one of the double canoes, is said to have leaped into the sea and found himself barely able to walk because he was out of breath and leg weary. This man was accustomed to such work; but against Akalele, the strength of a multitude was as nothing. Perhaps Akalele would have grown to be a great favorite of the king, had he remained with him longer; but he chose to return to Kauai. When he was ready to leave Hawaii, a wind storm was blowing; and he was warned not to sail. However, he sailed anyway, boasting to those on shore, "When did the wind ever carve a paddle?" as he patted his blade. The warnings proved prophetic, and his strength failed against the wind. He who elevates himself shall be humbled. Kawaimomona and Kepaalani, Canoe Paddlers. Kawaimomona was also a strong paddler, but his strength was not tested as was that of Akalele. It is said that with a single stroke Kawaimomona could make a canoe come gliding in on a wave. Kepaalani, too, was known as a strong man, but his strength was not put to the test in the same way as Akalele's. When his canoe left the harbor of Kailua to go to Kawaihae, he paddled without pausing to rest until he reached shore. Because of this ability he became a favorite of the king, and it was thus that he received the whole of Puuwaawaa and the fish ponds Paaiea in Makaula and Kaulana in Kekaha. It is said that he was not very good at paddling according to rules, but this was not so important as the fact that he landed where he wanted. Rules for canoe paddling were customarily observed in ancient times, and Kamehameha had been trained until he was skilled at it. In paddling either on the right or on the left he moved his paddle from the outside inward. He was also taught canoe surfing, in which both he and Kaahumanu were most skilled, board surfing, and so forth. In Puaa, North Kona, is a famous surf called Kooka, where a coral head stands just outside a point of lava rocks. When the surf dashed over the coral head, the people swam out with their surfboards and floated with them. If a person owned a long narrow canoe, he performed what was called lele wa'a, or canoe leaping, in which the surfer leaped off the canoe with his board and rode the crest of a wave ashore. The canoe slid back of the wave because of the force of the -shove given it with the feet. When the surfer drew close to the place where the surf rose, a wave would pull itself up high and roll in. Any timid person who got too close to it was overwhelmed and could not reach the landing place. The opening through which the surfer entered was like a sea pool, with a rocky hill above and rows of lava rocks on both sides, and deep in the center. This was a difficult feat and one not often seen, but for Kaahumanu and the king it was easy. When they reached the place where the surf rose high, they went along with the crest of a wave and slipped into the sea pool before the wave rolled over. Only the light spray of the surf touched them before they reached the pool. The spectators shouted and remarked to each other how clever the two were. This art was held in esteem at that time, and so the surfing places were constantly filled with men and women. The surf of Huiha at Honuaula in Kailua proper, directly above the place where ships anchored and just seaward of Keikipuipui, was rough when it rose. A person who had just learned to surf was afraid of it, but those who were skilled regarded it as fun. The landing place for this surf was a circle of sand. The water swirled gently as it went out from the shallows, and it was there that the surfers came in to reach the sand circle. Huiha and Kiope were covered with surf riders when the sea was rough and the surf went all the way up to them. There were two small points on the north side of the sandy landing place, covered with the coarse 'aki'aki grass, and to the north, a point of pahoehoe. Just a little north of this point were two coral heads which were used to gage the surf. On the inner side of the pahoehoe and on the north of Keikipuipui, was a surfing place for children and for timid men and women. If the king rode in, he went ashore gracefully on the surf of Huiha; but when it was rough he went right in to Kiope. Sometimes he could hardly reach Kiope because of the narrow entrance. The surf dashed over the point of pahoe-hoe and washed unobstructed and gently into Kiope. Here the mark that was observed for the rising of this surf was the point of Kaliliki. If the sea sprays rose upward two or three times, that was the number of the waves. ... sprays of Kaliliki went upward with force, a high surf was indicated and the timid kept away. The skilled went close to the source of the surf and remained there. As to the king, he was frequently seen leaping from a canoe on this surf. Expert surf riders unused to this surf were tossed about by it and found it was wise to sit still and watch the native sons, who were familiar with it, crouch in the flying sprays. A swimmer daring enough to try to land would be killed. Many surfs were used in this popular sport. There is a surf on the south side of Huiha. Kiikau is the inner surf; Naohulelua, the outer one. Both run toward the south going shoreward. The surf of Kamakaia at Auhaukeae runs shoreward toward the north. When the sea is rough the surfs there meet with those of Naohulelua. The surf of Kamoa at Keolonahihi and Puu runs toward the north side of Puu, directly beyond the spring there. The surf of Kaulu in Keauhou is a long one, and similar to the surf of Kamoa. The surf of Kapahukapu is at Napoopoo. There is also a surf at Keei and another on the east side of Kalae in Kau named Kapuuone. Two others are the surfs of Paiahaa at Kaalualu and Kawa in Hilea. Kanukuokamanu in Waiakea, Hilo, also has a surf; Punahoa has one; and Piihonua has one, named Huia. There is also the surf of Paula at Puueo. The surf of Kapoai is a long one, said to run a distance equal to that of fifteen ahupua'a, beginning at the Honolii stream. Papaikou has a surf that rolls toward the mouth of the stream. There is also a surf at Laupahoehoe, said to be the surf that Umi and Paiea used. Waipio, in Hamakua, has a surf that runs toward the sand. The surf of Maliu in Halelua, Kohala, rises on the east side of Kauhola Point and is 3 to 4 chains long, or longer. Kekakau surfed there, and it is said that he was most skilled in surfing. He was a kamaaina of the place, and it was he who led Kaahumanu to the surf of Maliu. Perhaps that was when the chiefs were farming in Kauhola. No one remembers the year, but it is said that Kauhola was cultivated before the two battles of Laupahoehoe. As the story goes, Kaahumanu and Kekakau swam or went by canoe to the spot where the surf rose. Before they left, Kekakau talked with the king about the nature of the surf and showed Kaahumanu the places to land, which would be signaled by the waving of a white tapa. If the tapa was moved to the right or to the left, she was to go to the side indicated before the sea rose up high and overwhelmed her. If the tapa was spread out, or perhaps wadded into a ball, the signal meant to go in on the middle of the wave. Kekakau told the chiefess to observe the signals on shore while they rode shoreward from the place where the surf rose to the place where the wave rose up high until they landed. Before they started the earth ovens had been lighted for roasting dogs, and by the time they reached shore, the dogs were cooked. The surf of Kumoho, which is at Naohaku on the left side of Maliu, was not ridden when the sea was rough. ... resembling a sea pool, yet it was famous. The surf of Kapuailima is in Kawaihae, and Kahaleula is in Mahaiula. Honokohau has a surf, and there are others in the various districts of the island of Hawaii. The surf of Puhele is in Hana, Maui; the surfs of Kaleholeho, Kaakau-pohaku, and Paukukalo are in Wailuku; Kahahawai and Popoie are in Waihee; and Vhailio and Vo are in Lahaina. Kapua and Kaihuwaa are surfs on Oahu. Kapuni and Kalehuawehe are at Waikiki, and Vlakua is a surf at Honolulu. Leimoku is a surf that washes up to the sands of Waianae, and Waimea in Koolauloa has a surf that runs toward the mouth of the stream. The surf of Kamakaiwa is in Kapaa, Kauai, and so is the surf of Kaohala and one that runs to the sand of Wailua. Others are the surfs of Poo, Koalua, and the one that runs to the mouth of the sand-bottomed stream of Waimea, and the surf of Manalau is in Waioli. The surf of Kaununui is in Niihau. These are the only surfs known. It is up to you to name the remainder. Here are three kinds of surfboards. The 'olo' is thick in the middle and grows thinner toward the edges. It is a good board for a wave that swells and rushes shoreward but not for a wave that rises up high and curls over. If it is not moved sideways when the wave rises high, it is tossed upward as it moves shoreward. There are rules to be observed when riding on a surf. The 'kiko'o' reaches a length of 12 to 18 feet and is good for a surf that breaks roughly. This board is good for surfing, but it is hard to handle. Other surfers are afraid of it because of its length and its great speed on a high wave that is about to curl over. It can ride on all the risings of the waves in its way until they subside and the board reaches shore. The 'alaia' board, which is 9 feet long, is thin and wide in front, tapering toward the back. On a rough wave, this board vibrates against the rider's abdomen, chest, or hands when they rest flat on it, or when fingers are gripped into a fist at the time of landing. Because it tends to go downward and cut through a wave it does not rise up with the wave as it begins to curl over. Going into a wave is one way to stop its gliding, and going onto the curl is another. Skilled surfers use it frequently, but the unskilled are afraid of this board, choosing rather to sit on a canoe or to surf on even smaller boards. Body surfers use their shoulders like surfboards. When the surf rises before breaking, it is time to slip onto the wave by kicking hard and working the arms. The contraction in the back of a surfer causes him to be lifted by the wave and carried ashore. The right shoulder becomes the surfboard bearing him to the right, or the left shoulder becomes the board bearing him to the left. Liholiho was most skillful in this sport. There are many ways to show skill in canoe surfing. The king was especially noted for it, and so was his pupil, Gideon Laanui. ... Kapuni, outside of Kiikiiakoi. They would allow waves to go by until they saw one they wished to glide on, then ride it to the spot where they chose to land. There are ways of selecting waves which will go all the way to shore, and the king and his pupil were unusually skillful at this. Such things were actually taught. It was said that a person skilled in canoe paddling and estimating waves could overcome obstacles if the wind was from the right direction, and the ability of the participants became something on which to gamble. This custom remains to this day, and it may be so in the future. Kaahumanu and Canoe Surfing, circa 1825-1830. ... then another to proclaim the gospel of Jesus Christ. All of her people who followed it were blessed. Kaahumanu's circuits of the land were always by canoe, for she had learned all about canoeing and surfing from Kamehameha I, her cousin, lord, and husband. When the canoes arrived outside of Waipio the next day, the waves were very rough and there was no place to land. Therefore, Kaahumanu ordered the paddlers to go out and come in a second time. This time they were close to the back of a wave that rose up directly in front of them, and she encouraged her paddlers to head for it. The canoe came up very close to it and as the wave rose up to a peak and spread out, the craft rode in with the foam to where the prows could be caught by the men on shore. Those on shore remarked to each other how cleverly they were saved, and this became a great topic of conversation. Geoff Cater (2007) : John Papa Ii : Fragments of Hawaiian History, 1868-1870.